The GLCM team started January 10th, 2017 at 0300 hours in order to meet the day’s jam packed schedule. At 6:00 a.m. we hopped on the 45 minute flight from Singapore to Kuala Lumpur (often referred to as simply KL). From there it was onto the tour bus and into Malaysian traffic. The bus ride included a few cultural pitstops and information from our new tourguide. Please see AM Tuesday, January 10, 2017 blog for the description of our riveting morning! 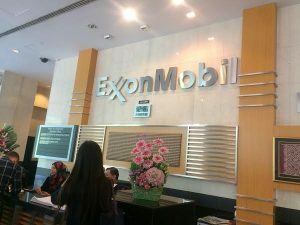 At 12:30 p.m. following lunch, we headed out to ExxonMobil Exploration&Production Malaysia, Inc, the Malaysian corporate headquarters located in the KL City Center. The building also houses the Malaysian Research&Development and Business Support Center. Once off the bus we were met by Ryan Clark, welcomed into the lobby and given badges to enter the building. From there we ascended to the 16th floor. 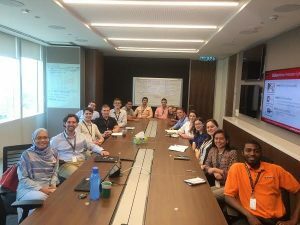 The ExxonMobil team on this floor had recently instituted a nomadic office lifestyle wherein employees have no permanent office but instead routinely sit in different locations. The GLCM team institutes a similar policy in office visit seating and photography arrangements. Carman Mullins, Deputy Production Manager, was the first to present to the group. She is originally from Mississippi, has worked for ExxonMobil for over 20 years, 4 of them in KL. She gave a brief overview of the company’s production and employment structure and primary functions. ExxonMobil is responsible for over half of Peninsular Malaysia’s natural gas and a fifth of its oil production. Its Malaysian operations employ 1700 employees, 98% of which are Malaysian nationals. Of these 1700, nearly one-third work in the field (offshore) one-third above field (onshore) and another third with the Business Support Center (international call center). ExxonMobil has been operating offshore oil and natural gas exploration and drilling since the 1960s and 70s. They are currently working with and under PETRONAS, the Malaysian national oil company, through multiple production sharing contracts (PSCs). 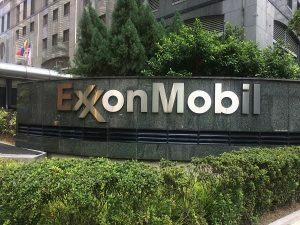 At the peak of their production, ExxonMobil in Malaysia could pipe out 1.5 million cubic feet of natural gas/day and 400,000 barrels/day of crude oil. Since the early 2000s, production has declined, especially for oil. However, advances in technology have brought about new and innovate methods to extract oil known as enhanced oil recovery (EOR) methods. These methods are employed in fields that already have existing infrastucture (brown fields) and completely new fields (green fields). 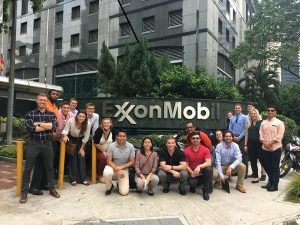 Following Carman’s introduction, three other employees shared their experience at ExxonMobil in Malaysia. 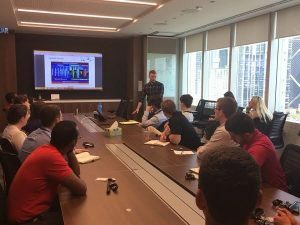 First up was Ryan Clark, 2009 graduate of University of Florida in Civil Engineering and five-year employee at ExxonMobil in Kuala Lumpur. He shared his time on three greenfield platform fabrication projects – Damar, Telok and Tapis. Damar and Telok followed a design one, build many approach, where the platforms were nearly identical and could be installed in similar manners using jack-up and temporary drilling rigs. To contrast, Tapis was described as the “mother of all projects”. This multi-billion dollar, multi-part venture involved prefabricating a new central processing platform (Tapis R Deck) offshore in its entirety. In order to transport this monstrous structure, one of the only two vessels currently available to mankind with the necessary shipping capacity were hired for the job (either the Black Marlin or Blue Marlin). Despite a six month delay in prefabrication, scheduling conflicts with Dockwise (owners and operators of Black/Blue Marlin) and a rather problematic and slippery transfer of platform to Marlin, the central processing platform was successfully installed in the South China Sea. Last up was Sean Rochford, fourteen-year ExxonMobil employee (although only 2 months in KL), and another graduate of Purdue University. Sean has spent his entire time at ExxonMobil as a Reservoir Engineer and continues in this role. He took the GLCM team through the fundamental steps of exploration, development and production of oil. 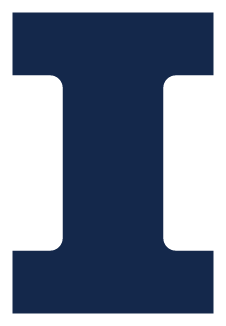 These include opportunity identification and evaluation, opportunity pursuit and capture, discovery and appraisal, evaluation/concept selection, design, construction, drilling, operation and finally asset disposal/abandonment. Sean described this as the life cycle of an asset. To go more in-depth he described the process of exploring reservoirs, drilling test wells and finally determining the volume, feasibility and quality of an oil or gas reserve. It is the job of a reservoir engineering to collect data on physical cores, geological, seismic and fluid properties of reservoirs. Carman Mullins will soon transfer to ExxonMobil East Canada to be country leader. 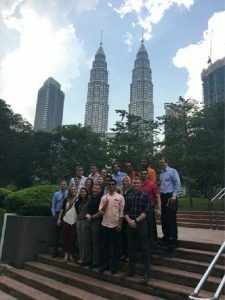 Ryan Clark intends to remain in Kuala Lumpur and continues to learn the native Malay language with the help of the Language Learning School. Although Yee-Leong spent three years working in Chicago, he is a Malaysian national and also intends to remain in KL. 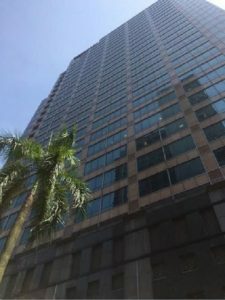 Sean has been in KL for only a short few months, but is definitely enjoying his new residency, and says finding food and finding friends is no trouble at all. We thank them all for taking time to speak to us today and we thank you for following our adventures in Singapore and Kuala Lumpur! Selamat Tinggal (Goodbye) and Terima Kasih (Thank You) in Bahasa Melayu (Malaysian Language).